"Israel's political and military leadership has done the right thing by preparing a realistic military option (for attacking Iran)," former Military Intelligence chief Maj.-Gen. (res.) Amos Yadlin said Tuesday morning as the International Atomic Energy Agency announced that it had reached an agreement with Iran on nuclear inspection. At a Herzliya conference addressing the challenges facing the Israel Air Force in light of changes in the Middle East, Yadlin qualified his statement, saying "Using this military option would require us to consider in advance what would happen not only immediately afterward, but also 10 years later." "Iran can renew its nuclear development, and therefore when weighing whether to attack or not Israel must consider US opinion and the international community's view of a strike," Yadlin observed. "Because of the changes that will take place in the region, we will need them after (any) strike on Iran, if there is one," Yadlin said. Yadlin assessed that a strike on Iran would delay its nuclear program by three to five years. After that, he said, it would be necessary to continue pressuring Tehran, and Israel could not do that alone. Yadlin added that the current talks in Germany between Iran and the five UN Security Council members should not be written off as a failure, but studied thoroughly. "We need to see if the summer of 2012 brings us a reasonable deal, or if we will need to exercise other options," he said. 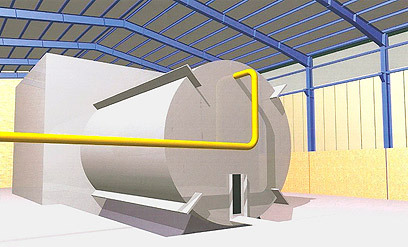 a) The removal of some six tons of uranium enriched to 4.5% to a place from which Iran wouldn't be able to use it would be insufficient, Yadlin said, since the since the uranium enriched to 20% is the material that poses a danger to world peace and would allow Iran to assemble a number of warheads. b) The existence of the nuclear site adjacent to the city of Qum, Yadlin argued, allows uranium to be brought into the "zone of immunity" and enriched to the highest level without the risk of being attacked. "Closing (this) facility closes the immunity zone," he stressed. "Any agreement that includes these three elements is a reasonable one," Yadlin said, a day after Prime Minister Benjamin Netanyahu and Defense Minister Ehud Barak called for much harsher measures. The former Military Intelligence head said he believed that if no reasonable agreement were reached, Israel would have international legitimization to use other options. Earlier Tuesday, IAEA head Yokiya Amano announced that a deal on the inspection of Iran's nuclear program had been reached and would "soon be signed." At the conclusion of a surprising two-day visit in Tehran, which included meetings with senior Iranian officials, Amano announced the decision to end the meetings and sign the agreement. 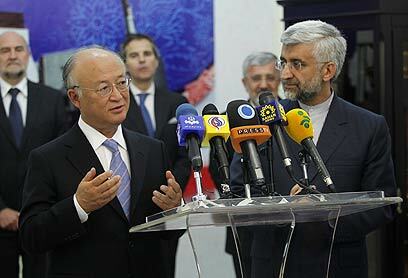 While a number of details remained to be worked out, Iran did not plan to prevent the final signing, the IAEA said. Israel has not yet issued an official response to the announcement, but a diplomatic operative said that "Unless (they) have reached an agreement that stipulates inspection of all Iran's nuclear facilities, the deal isn't a cause for optimism. Iran 'agreeing to oversight' means that they're either stopping activity in the facilities they are prepared to open for inspection or are running some kind of trick.'" According to Yadlin, who addressed the issue with unusual candor, Israel should employ the full force of its power in future wars. He said he believed that it was a mistake for Israel to bow to US pressure not to attack civilian targets in Lebanon during the Second Lebanon War. "The Americans who pressured us not to attack out of concern for the government of (then-prime minister Fuad) Saniora forgot to worry about the Olmert government," Yadlin said. See all talkbacks "Yadlin: Don't rush to declare Iran talks a failure "